Apple has released a Christmas-related television commercial, “Under the Covers”, for the iPhone 4. 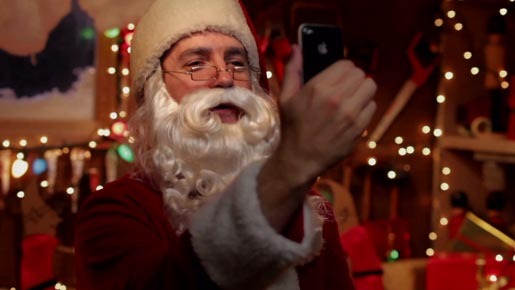 FaceTime lets you easily enjoy video calls with the people you really care about… like Santa. A young boy interacts with Santa Claus from under the covers of his bed. The ad features The Christmas Song (Chestnuts roasting on an open fire) made popular by Nat King Cole. The Under the Covers ad was developed at TBWA\Media Arts Lab, Los Angeles, by chief creative officer Duncan Milner, executive creative directors Eric Grunbaum and Scott Trattner, associate creative director Krista Wicklund, art directors Deborah Casswell and Parker Grant, copywriters Natalie Ranger, David Young and Louise Shieh, agency producers Hank Zakroff, Mallory Gordon and Christopher Shaw.